Northern fur seals are the latest marine mammal species to fall victim to abnormally warm ocean waters and a lack of food sources. Like the California sea lions and Guadalupe fur seals before them, these young, starving pups are stranding in record numbers. Northern fur seals at the Center. 2015 has been a year like no other for The Marine Mammal Center—with six weeks still remaining, we’ve already rescued more seals and sea lions than ever before in our 40-year history. By February, we had rescued a record number of California sea lion pups—all younger and skinnier than we typically see. Many of these pups had been weaned way too early to survive on their own. 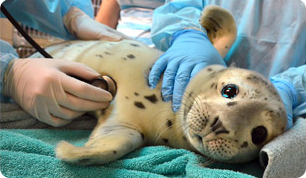 By April, our busy elephant seal and harbor seal pup seasons were in full swing as well, and we were caring for a record number of patients onsite at our hospital in Sausalito, California: 291. In fact, we cared for more than 200 patients at a time for three solid months. By June, we had rescued more than two dozen Guadalupe fur seals, five times our record yearly rate—a distressing statistic given this animal’s population status as a threatened species. By October, we thought we were done breaking records when we admitted our 1,632nd patient, breaking the all-time high set in 2009. But within days, we had rescued Zachary, the first of what would become many northern fur seal pups stranding on our shores. So far, we have rescued more than 80 northern fur seal pups—three times the number we cared for last year and more than twice our previous record in 2006. Northern fur seals are feistier than California sea lions. All told, we have rescued more than 1,747 seals and sea lions so far this year—breaking nearly every record in our 40-year history and, more importantly, raising alarming questions about the health of our ocean. Most of those questions surround the climatological phenomena dubbed “the blob,” an unusually large and persistent area of warm water that originated in the Gulf of Alaska and at times extended all the way down the Pacific coast to Mexico. Other factors likely also contributed to the unusually warm waters we’ve seen in this area since 2013. What’s happening off the California coast is caused not by any one environmental condition but rather a perfect storm: Unusually weak winds from the north and strong winds from the south are causing a change in currents and a lack of upwelling that would typically bring colder water and nutrients to the surface, which can increase fish abundance. These warmer waters, which some scientists also link to global climate change, seem to be affecting distributions of fish, causing marine mammals like sea lions and fur seals to have a harder time finding food close to their typical habitat range. And with an unusually strong El Niño taking shape in the equatorial Pacific, conditions are not likely to change much any time soon. The warm waters El Niño is expected to bring will simply reinforce or extend the dramatic effects we’ve seen to date. At stake are sensitive populations of marine mammals, such as the Guadalupe fur seal, as well as otherwise healthy populations, like the California sea lions, which have sustained their third year of elevated strandings—each worse than the year before. A record number of northern fur seals are at the Center right now. The record number of northern fur seal pups in our care right now were born in June on the Channel Islands. Northern fur seal pups spend about four months on the islands nursing with their mothers before taking off on their own to live a mostly pelagic life, meaning they spend most of their time swimming in the open ocean or on offshore islands. The fur seal pups we’ve been rescuing for the past month are about half the size they should be at this age. Our veterinary experts describe them as “emaciated,” which essentially means they are skin and bones, and in the poorest state of nutrition. This could be because the pups had trouble finding food once they weaned and set off on their own. But this stunted growth may have started on the islands—if mother fur seals were having trouble finding enough fish nearby to feed themselves, they may not have been able to provide enough milk to their pups. When these smaller pups left the islands, they might not have been strong enough to hunt for fish on their own, exacerbating their malnutrition even further. Many of these pups have a story similar to Zachary, the first northern fur seal pup we rescued this year. Zachary was found alone on Pajaro Dunes Beach, halfway between Santa Cruz and Monterey, California. Although Zachary was skinny and starving, she growled as our rescue experts approached, giving the team hope that she’d be strong enough to survive. After transitioning quickly from tube feedings of “fish smoothies” to whole fish, Zachary has nearly doubled her weight in the last month. Veterinary experts at the Center say that she could be ready to return to the wild after a few more weeks of nourishing fish meals. Zachary was extremely malnourished when she was rescued. While our dedicated animal care volunteers are working long hours to ensure every one of our 80+ northern fur seal pups gets a second chance just like Zachary, our scientists are looking closely at what’s happening to these animals and our ocean environment on a larger scale. “What’s especially concerning about this current northern fur seal crisis is that this species has a particularly difficult time recovering from unfavorable ocean conditions, such as these warmer waters,” says Tenaya Norris, marine scientist at The Marine Mammal Center. Many of the same questions that plagued us during the height of the sea lion crisis earlier this year still remain. While experts are able to explain how this is happening—unusually warm waters are affecting food availability for mothers and pups—they still can’t explain exactly why. No one was able to predict that this massive warm water blob would form and persist for the last year, so no one can predict when it will dissipate, allowing the ecosystem to rebalance itself. And with El Niño potentially contributing to the warm waters as well, the future becomes even murkier. What we do know is that the record numbers of stranded marine mammals we’ve seen all year indicate there is an urgent need for more science to help us all better understand what’s going on off the coast of California and how large-scale human impacts, such as overfishing and pollution, may be affecting the health of these animals and their ocean environment as well. Help provide the critical care that these starving young pups need to be successfully returned to their ocean home. Your contribution goes a long way to help individual patients like Zachary as well as support scientific research that will help ensure a healthy ocean future for marine mammals and humans alike. Stay in touch! Learn more about our pinniped patients and follow their fascinating stories. Adopt your own Northern fur seal! Poppy was a patient at the Center that was rescued at the Berkeley Marina and treated for malnutrition and exhaustion. Your symbolic adoption will help provide treatment for more marine mammals that are sick, injured, or orphaned. You can commemorate a friend’s special occasion such as a birthday, holiday, or wedding with a quick and easy eCard! Join us for an informative one-hour Docent-Led Tour of The Marine Mammal Center (for individuals and groups fewer than 10 people). Prices start at $9/adult.